It seems crazy, but it’s close to 10 years since I first crossed paths with fellow Sydneysider Kayte Nunn. I was editing Slimming & Health magazine at the time (may it RIP, sniffle) and Kayte was at Weight Watchers magazine. But despite being professional rivals, we became mates and I was THRILLED when her fabulous first novel, Rose’s Vintage, was picked up by Black Inc Publishing . It’s out now, and Kayte dropped by to tell us all about it. Journalist-to-author seems to be a well-trodden path! How did the authorly dream unfold for you? Writing in some shape or form has always been a part of my life, from childhood stories, angst-ridden teenage diaries and terrible poetry, to studying a degree in English and publishing and then eventually working as a features writer. I’d harboured a secret dream to write fiction for years, but never had the self-belief that I’d ever actually achieve that dream. The perfect storm of events came about when I had a gap between freelance assignments of about six weeks, my youngest daughter was in daycare three days a week and I’d recently read a couple of fairly ordinary books and thought well, I can do better than that (little did I know just how hard it was going to be!). It was a case of ‘now or never’. I was also training for a marathon at the time, and the similarities of the two disciplines were not lost on me. I set myself a daily word count and started writing, not thinking too far ahead, and trying not to worry that I somehow had to spin a story out over more than 80,000 words! And what about your journey to publication – how did you find your publisher? What was it like the day you got ‘the call’? After about a year I had a first draft. I started submitting to agents and publishers. I had a few requests for the whole manuscripts, but also my fair share of rejections. Then, one afternoon, the woman who is now my agent gave me a call and said she liked what she’d read and could I send her the whole mss. She got back to me a month later and gave me plenty of notes on what needed to change – including changing the nationality of the protagonist and adding more on the antagonist. I wasn’t precious about my work (having been a freelance non-fiction writer I was used to being edited) and hugely appreciated her insight. I revised and resubmitted to her about three months later and she began submitting to publishers. We had several enthusiastic replies, but that it was too close in tone and subject matter to other of their authors. One publisher offered very detailed and generous feedback, which I took on board and re-drafted. Then my agent submitted to Black Inc, which was building its contemporary fiction list. Rose’s Vintage was also close to an offer from the publisher who had given me the feedback, but my agent and I came to the same conclusion that a smaller publisher would be more likely to provide me with individual attention, which is so important for a debut novelist. Black Inc also offered for a second book, which by this time I was halfway through writing. I really feel like I did my apprenticeship on this novel – I could write, but I needed to learn to tell a story – to open up the watch face and see how everything needs to fit together. The feedback I got from one particular publisher, from my agent, from a couple of writing workshops that I did, and from my editor was invaluable and helped to make the book so much better – getting a novel published is much more of a collaborative process than many realise. The actual day of the call I was up to my elbows in filth, as we had sold our house and my husband and I and were cleaning it. I’d just had a feeling all that morning that something was going to happen, but when I got the call I was still shocked and it took a few days to sink in. I think I was more excited when my agent rang me earlier this year to tell me that Rose’s Vintage and my second book had sold in a bidding war to a German publisher. Friends came over with Champagne after that news! 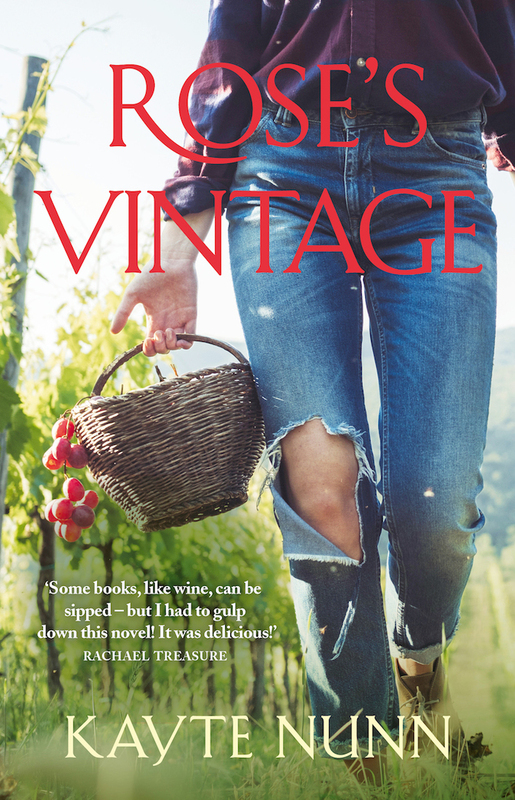 For readers who aren’t familiar, what’s Rose’s Vintage all about? ‘RuRo’ is one of the most enduringly popular romantic subgenres in Australia. Did you set out to write a rural romance, or did the story simply evolve that way? What do you think it is about these stories that resonates with readers in such a big way? I’d spent several years editing Gourmet Traveller WINE magazine and during the course of that rather wonderful job had visited many of Australia and New Zealand’s best wine regions. I had been taken by the wonderful sense of community and camaraderie that I encountered and also loved the gorgeous landscape, so it made perfect sense to me to set a book in a small grape-growing/winemaking community. Wine is such a sensuous product and lends itself to a love story as well as plenty of other shenanigans. When I was in my teens I loved a series of books by HE Bates that started with The Darling Buds of May – the warmth of the family and all the jolly things they did made me want to be a part of such a world, and I realised as I wrote Rose’s Vintage that I wanted to create a similar feeling in my work. Belonging – finding your tribe – is such an important human need, and Australian rural romance captures that – that feeling of community that can sometimes be lacking when you live in larger towns and cities. Plenty of people still like to deride romantic fiction as shallow, unrealistic, antifeminist, yada yada yada – despite it being the most popular fiction genre in the world! What are your thoughts on some of the tired clichés and stereotypes romance is still saddled with? People want to love and be loved and to know that it’s going to be alright in the end, to read about happy endings – that’s what romantic fiction gives them. I do think romantic fiction has evolved from the heroine being ‘saved’ by the hero, to stories now where the heroine saves herself but gets the man as well – which is actually a strong feminist ideal. What does a day in your writing life look like? Do you have a set routine or are you more of a go-with-the-flow kind of author? I try to write when my two girls are at school, after some exercise and then until the last possible minute before I have to pick them up – it’s no surprise to me that the hour between 2 and 3pm is often my most productive! Other freelance work does take priority, but I find that I often have breaks between projects. I tend to look at my diary a week ahead and plan the days when I will write. I try and do all my errands in the late afternoons, when the girls are around, otherwise they cut into my writing time. My two are quite sporty, so I spend a lot of time hanging around swimming pools and soccer pitches and gymnasiums. I often bring my laptop and sit in the car and write or at a table nearby. Luckily, after years of being in busy editorial offices I can write with almost any amount of noise. Have you found all that ‘pitching’ you do as a freelance journalist has been helpful in terms of promoting your book? Absolutely. Mostly it’s just common sense, but you have to think about why someone might want to interview you or review your book, and pitch a hook or an angle that’s specific to them, to give them a reason to interact with you. What’s next on the writing agenda for you? I’ve finished a second book, The Angels’ Share (which is what the wine that’s lost to evaporation when it’s in barrel is known as), also set in the Shingle Valley, which will be published in 2017, and I am now working on a historical mystery set in late-Victorian England, Chile and Sydney.